After a week of riding through South Australia, I'm under the impression that SA has considerable winds and flies. Still pretty agricultural areas with wheat, sheep and pastures. Last night found a good bistro at Streaky Bay at the hotel/motel. Also popular with many locals. This morning quiet starting out. Road turned SE and mostly flat to start. At 39 km was a sign, "Murpheys Haystacks -- 2". 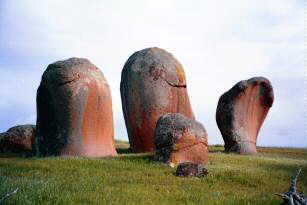 Seemed intriguing so followed the road up the hill and to interesting shaped large granite boulders. From the hill, could also see over the land. Mostly rolling terrain with fields. To the west were bays and rugged coasts. I didn't follow signs further, but there are also sea lion colonies here. Weather in the morning was intermittent rain showers and some wind. After Murpheys Haystacks, more gently rolling terrain until I reached Port Kinney at 66 km. Small post office store was open. Had brunch there. Also talked with caravaners who had passed me a few times in the last week. South of Port Kinney was first a turnoff to Venus Bay and then to Talia Caves. Town of Talia itself was listed on the map, but was only a road junction without houses. A 2 km long hill to climb here. Winds were mostly crosswinds, particularly as the road turned further west at Talia. At 84 km were signs to Lake Newland, discovered and named by Edward John Eyre. This lake was right along the coast. It was filled both by seepage under the dunes and fresh water runoff. At 90 km was Colton with a few old buildings but not much else. Nearby was an old Greek cemetery. There was one more big hill at 123 km. A flock of sheep fled as I cycled past, only to circle back curious to look at my bike. They fled for a second time as I rode off. Fortunately after this the road turned a bit more from the wind. Was happy to see Elliston. Two caravan parks, an old hotel, a general store, a bakery and a grocery store. After I arrived two brief but intense rainshowers. 130 km today, 18519 km cumulative. A rain squall just as I was about to leave. Hard rain, but in fifteen minutes it was done and I was on my way. Calm winds, picking up through the day, mostly from SW so a crosswind. Climbed a bit from Elliston. The fields had some bare rocks, so more sheep pastures and less wheat. In some areas, stone fences had been built. After 20 km, a nice descent and then climb on the other side. At 41 km was Sheringa. The Sheringa General Store was for sale and had a sign indicating it was no longer in business. There was an old Anglican Church and a few buildings from nearby station. At 60 km I came past Lake Hamilton and second rain squall for the day. A sign indicated a lookout and monument 500m away. I climbed the hill and found a memorial to Leo Cummings who had lost his life when a fishing boat overturned in 1959. Leo was 23 when it happened. I could see over cliffs to waters washing on shore. At 74 km was Mount Hope. A few buildings here including a RSL Memorial Hall but no commercial establishments. Fortunately after this, some trees along the way to shelter the wind. By now the sun was shining brightly, previous rain showers gone. Small black caterpillars walked quickly across the road. At 92 km was a rest area that would be suitable for camping. A little later the sheltering trees disappeared as I came past Lake Greenly. On the other side at 101 km signs said Warrow. I didn't see any businesses, but did see a sign for B&B/Caravan Park/Camping, 2 km away. Decided to follow those signs since I wasn't certain of other places before Port Lincoln. A few twists and turns and I was at Wepowie, just prior to third rain squall for the day. 103 km today, 18622 km cumulative. Today an easy ride and day in the biggest town since Esperance. A few more lingering showers in early morning and then dry. Left the Bed and Breakfast before breakfast, though had supper with them last night. Had corn which is one crop I haven't seen yet...apparently grown in Queensland. This is a wheat, barley and oats area. Still also sheep country. Saw one flock today where half had been shorn and the other half still had long fleece. It was 2 km back to the sealed road. Four km further were signs for Coulta, though not much visible in town. There was a tea house and snack bar. The first 12 km were a gradual climb and at 21 km there was a rest area at top of a hill. Nice spot for a brekky break. In distance was Mount Dutton Bay, 6 km away, signs indicated a hostel and B&B. After 26 km reached Wangary. It was 7:50 am and the store opened at 8 am, so waited briefly. From here the road turned more eastwards with a few more rolling hills. Saw a confused kangaroo that fortunately got off the road before an oncoming truck. At 64 km was one last hill before a long descent into Port Lincoln. Port Lincoln had over 10,000 people and is thus about the same size as Esperance. Got a replacement digital camera here (still going to drop the other one off for repairs in Adelaide or Melbourne) and also dropped off four rolls of film to be developed. In afternoon went to visit a seahorse farm. They are one of five places in the world that raise seahorses commercially, one of the others is in Tasmania. Approximately 20 million seahorses are harvested for medicinal and aquarium trade. This farm focuses on the aquarium trade. There were about two dozen tanks each labeled with different ages and species. No photos allowed. Different species vary in adult size from 2.5 cm to 30 cm. These seemed to be up to 15 cm, with many tiny hatchlings as well. After the seahorse farm, I went to a local railway museum. Passenger traffic stopped in 1968, though the caretaker still talked in first person about working for South Australian Railways (S.A.R.). It was a fun collection of different railway memorabelia. For example, a chart showing the nine different combinations one could place tags on pigs ears. Prior to confederation in 1901, at least four different gauges of rails were used by different states in Australia. In evening found another good bistro for dinner and then worked further on updating web pages with photos developed today. Two days ago, I had seen a convoy of eight caravans at Elliston. They recognized me at dinner and were a group from Victoria traveling the Eyre Peninsula for school holidays. 71 km today, 18693 km cumulative. The flies are back, but fortunately the winds are less. The eastern side of the Eyre Peninsula is less rugged than the western side. Today several small settlements along the route. From Port Lincoln the road went along the water, past sheltered Boston Bay. This was a signed bike route, though only between 8:00am-9:00am and 3:30pm-4:30pm on weekdays! Tourist signs seem to use Sydney Harbor as a unit of measure and Boston Bay is described as five times as large as Sydney Harbor. Mostly wheat fields though I also saw sheep. One farm had a herd of caribou and another signs for ostriches. I stopped briefly at a historic marker that indicated the first sheep were driven overland here in 1845. Here I noticed my back tire is starting to wear through, less than 4000 km on it since Perth. I have two spares, but will be looking for another tire after replacing front and back. At 48 km was Tumby Bay. I took the turnoff and went into town. Tumby Bay had nice small downtown street, an old hotel, a bakery, two museums, a minimart, a post office and a petrol station. I had brekky at the Boatshed Diner and mailed away computer disks at the post office. Seemed like Tumby Bay was a nice small town to visit, though I wanted to get a bit further today. Tumby Bay was settled in 1840s and was an important grain-loading port. From Tumby Bay back 5 km and then slight rolling hills through the wheat fields. Caravaners I'd met before passed with a friendly toot. Signs to Port Neill (home of the whiting) said 35 km. When I got close, there was a turnoff with 3 km into town. I decided to bypass Port Neill and keep going. Arno Bay turnoff was at 120 km. Overcast skies had cleared. It was warmer, though unfortunately this also brought out many flies. I didn't mind when they rode on my shoulder but found it obnoxious to have them crawling on my face. I'd shoo them away and a bit later they would be back. From road junction to Arno Bay was 2 km. There was a small supermarket and lawn bowling partway and then an old hotel and caravan park at the beach. Looked inviting, so I decided to stay. Got a site at the caravan park and can hear the waves on the beach. A short distance away is the fishing jetty. There is a small shed, a reminder of the superphosphate that used to be brought ashore here for fertilizing the fields. Arno Bay started out named Bligh in 1883 but was renamed in 1940. 121 km today, 18814 km cumulative. A change in landscapes today. Annual precipitation in Whyalla is about half of that in Port Lincoln. Between Arno Bay and Cowell wheat fields continued. After that intermittent fields, but mostly scrub and later small plants that remind me of sagebrush. Left Arno Bay early to mostly clear skies. A cool morning as I rode past wheat fields. A few gradual hills including Elbow Hill before reaching Cowell at 45 km. Cowell had a wide main street with some shops on each side. A large silo just outside town. There were two old hotels, a motel and caravan park. I stopped briefly at bakery before having brekky at the roadhouse. As small Eyre towns go, my favorite is Tumby Bay with Elliston second and Cowell third. After Cowell more scrub with a few fields behind in the first 40 km. The road was surprisingly rough to start, but fortunately got better after 25 km. Some more low hills to climb over, but a nice downhill at 102 km. After this scrub cleared with low bushes similar to those I'd seen across the Nullarbor. From top of the hill I could already see Whyalla in the distance. A few smokestacks from the steelworks plant. Covered that distance fairly quickly helped by a tailwind. Whyalla has population of 25000+. Six kilometers from town, the road became two lanes each way. I followed signs through town, over a hill and to the tourist bureau. Nearby was a large steelworks plant, the major employer in town. Also here was a maritime museum in shape of a ship. It was 3:30pm and I wasn't in a sightsee mode. Instead I got directions to a bike shop in town. Rode there and purchased another tire. Found a travel agent and asked about the Ghan railroad (no help, contact railway directly). Found a hotel where they had a good price, though warned me the band named "twice shy" would play until 4 am. Had some time to walk around town at the end of a long day. 152 km today, 18966 km cumulative. 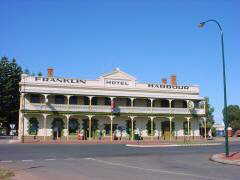 Left Whyalla (city of contrasts) after brekky at the hotel. The band wasn't too loud, though floor of the dining area looked like a good party. I awoke when they stopped playing at 4 am, not when they started. Today more riding through arid landscapes. Low scrub bushes about 50 cm high with occasional areas of taller trees. To the east was a low range of hills which I crossed through on way to Port Augusta. A front has been passing through with westerly winds and occasional rain. Initially these were crosswinds but the second half they blew me into town. On the north side of Whyalla was the steel plant, but soon thereafter desolate scrub. Both a railroad and a pipeline paralleled the route for most of the way. After 50 km, reached the main highway 1 which I had left a week before. A mostly flat area and I was in Port Augusta, "Crossroads of Australia". Port Augusta has 15000 people and has historically been a center for heading into the outback. I found the visitor center and also a good museum named Wadlata Outback Centre. It had exhibits about outback history, aborigines, mining, exploration, train travel, etc. I walked through town and briefly stopped at an internet cafe. I'm not done cycling the outback yet. From here my revised plan will be to first ride northbound to Alice Springs and then take the Ghan train back to Port Augusta on October 26th. Went to a travel agent and bought a train ticket. Also stopped by the bike shop to get some more chain lubricant and to supermarket for groceries. Rear tire definitely needs to be replaced so my plan is to replace one or two tires this evening. 76 km today, 19042 km cumulative. Today a long ride helped by a tailwind. Weather forecasts called for strong gusty south winds while a front moved through. Mostly SW today, still nice to have as I headed north from Port Augusta. Riding back to the outback. One kilometer to the start of the Stuart Highway. In the first five kilometers, several indicators of the outback: (1) a triple road train, (2) a sign, "drowsy drivers die", (3) a sign for "animals on road" with pictures and written in English/Japanese/German and wide open lands. Most amusing I found a large sign with a picture on it, "Welcome to the outback". Somehow seemed out of place and also strange to require a photo. For the first 20 km, there was wide open lands with only low bushes. After that more scrub. Both the railroad and a pipeline paralleled the highway. At 50 km, the highway crossed over the railroad. Also here was a spigot on the pipeline, so I topped up on water. Nice tailwinds to blow me along for the next 10 km. Here was a rest area for "ranges" with nice views and a few information signs. Mostly scrub until past 100 km where the road climbed over some low hills. Many flies again in the open areas. More scrub between 125 km and 145 km and open land after that. At 150 km was a long hill with rest area at the top. Nice view over salt lakes to the west. The white salt almost looked like clouds. A truckie stopped here with his load of large plastic tanks. While four tanks were visible, he actually fit up to forty tanks by nesting them. These tanks were manufactured by "rotor molding" and were headed from Adelaide to Darwin. Very low plants the last 20 km as I slowly made my way to Pimba. It was late afternoon and I was happy to see the roadhouse. Six km east of here is Woomera, the Australian rocket research and launch center. Hoping for wind to either shift or abate tomorrow as the road turns a bit more to the west. 171 km today, 19213 km cumulative. Today an easy ride helped by a tailwind. Pimba Roadhouse is open 24 hours so I had brekky before I left. TV was on with reports of attacks in Afghanistan. These outback roadhouses typically have one or two TV channels. Here it was 7 Central (Adelaide) and Imparja (Alice Springs). The TV logo said Imparja, so apparently the Imparja network was showing the CNN feed. Nice riding through open terrain. Only small low plants to start. I crossed the first of six cattle grids. Only saw one flock of sheep today. After 20 km was an overlook to dry lake Gairdner below. The flat salt lake bed has been used to set land speed records. After 25 km, the road descended into an area with more scrubby trees. At 40 km was a roadside rest area with information signs about Lake Hart, another dry lake. The scrub trees became sparser as I rode along. A brief open stretch before more trees at Glendambo. This route roughly followed the railroad line and crossed over the tracks at 100 km (this is both Ghan and transcontinental Indian Pacific lines here...the Ghan was rerouted several years ago, prior to that tracks were frequently damaged with flooding and unstable lands). Just 13 km further came to Glendambo. Glendambo has two roadhouses, a general store and a motel. When the Stuart Highway was realigned in 1982, businesses in town of Kingoonya were moved 44 km to what is now Glendambo. Looked around town in afternoon and then got in out of the the flies. The motel and tourist center is large with sixty rooms. It has small outback fauna area with a few emus. There is also a small gift show with local opal products. 113 km today, 19326 km cumulative. There is a distance of 252 km from Glendambo to Coober Pedy. Today I rode almost half that distance. Landscapes all day were similar. The tallest trees are about 3m high. These trees are sparsely mixed with low bushes. Soils are becoming a bit redder. Mostly flat with very slight grades. I crossed eight cattle grids today, saw numerous signs for homesteads but saw neither sheep nor cattle. Just north of Glendambo were signs indicating that this was prohibited area and that this was prohibited area and that one should travel only along the main road. 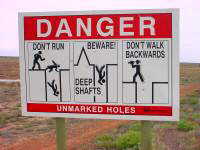 This was part of the downrange area of Woomera. Woomera rocket range was established in 1947 as a joint project with the UK. It was also used between 1960 and 1972 by NASA. The town of Woomera was a closed town until 1982, but is now open. The downrange areas are still closed except for the travel corridor. A bit further to the west is Marlinga where the UK exploded half a dozen nuclear bombs in the mid 1950s (aborigines were living in that area, but after having some radiation sickness, moved to Yalata). Winds were calm when I started and I made good progress. At 50 km this changed quickly as the wind picked up from the east. For the rest of the day I had a mixture of east crosswinds and north headwinds. At times my speed dipped below 10 km/h as I slowly pedaled upwind. By end of the day I was ready for a break. At 50 km I met another cyclist. Eneko was a Spanish cyclist from Basque region of Spain who was riding around the world. He had started in Spain and already ridden through southern Europe, Turkey, Iran, Pakistan, India and further on his way through Australia. We traded information about water stops and items along the route. At 84 km was the Bon Bon rest area with information signs and a water tank. Stopped briefly for bite to eat and to recharge for riding into the wind. From here it was slower. At 124 km was a sign for another rest area. It was a bit open, though not much more than the rest of the area. I set up my tent and called it a day. In the evening, a caravaner came with a big problem. The frame of his towing rig had cracked. He got some wire to try bracing the metal, hopefully enough to allow him to get to Glendambo tomorrow and have it welded. 124 km today, 19450 km cumulative. A front passed through overnight with thunder, lightning, rain and wind. The tent was dry except for a spot at my feet where it puddled. That had soaked in by morning. Light winds as I packed my wet tent and got on the road. 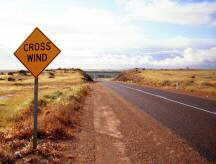 Winds mostly from the west, so crosswinds. Low scrubby trees continued for the first 25 km. After that wide open spaces with no trees. At 37 km was the Ingomar rest area with the next installment of roadside displays describing explorers and natural sights. Winds slowly picked up from the west. Several more cattle grids today, though no livestock. Saw one kangaroo, some birds and not much else. Most of the caravans I saw were heading southwards, presumably with start of Spring and end of school holidays. Many triple road trains, usually giving me wide room. As I got closer to Coober Pedy, I noticed a few indicators. At 68 km signs indicated start of the opal fields. Also "mining equipment on road" signs. I passed the northern boundary to the Woomera prohibited area. Made a quick stop at 98 km. After this the road turned more into the wind. The last 15 km took me almost two hours, so I was fairly tired on reaching Coober Pedy. Stopped at the information center and then booked at a motel for two nights. Dried my tent in the wind and wandered quickly around town. I have tomorrow to explore further, but on initial look there are two dominant themes in town: underground buildings and opals. Coober Pedy is the largest producer of opal in the world (90% of the worlds opal comes from Coober Pedy, Andamooka and Mintabie in Australia). There are many different opal shops, museums and signs of the opal industry. Opal was discovered in 1915 and early miners included returning soldiers from WWI. Approximately half the 3500 residents live underground. There are also motels, churches, bookshops and other structures underground. I'll have tomorrow to explore further. 128 km today, 19578 km cumulative.